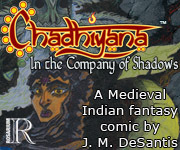 Chadhiyana.com | Chadhiyana Creator, J. M. DeSantis, on Patreon! For a long time now I’ve toyed with the idea of crowdfunding, drawn by its potential to help fund personal, independent projects. As it is, personal, independent projects have been a major part of my career as a writer and artist, yet I’ve never been certain if I could carry a campaign all on my own. But then, over a year ago, I became aware of Patreon. I don’t know the precise date where I first stumbled upon Patreon, but I do know the place: on the YouTuber VaatiVidya’s page (I often listen to Dark Souls lore videos while I art–among other things–and Vaati’s is one page I listen to often). When I clicked the link to his Patreon page, I was immediately intrigued by Patreon’s model of on-going support for creators rather than a 30 day campaign for a single project. I began thinking then of if and how I could get it to work for me (at the time, I didn’t even know writers or artists were doing this sort of thing). Though I’m ever a slow adopter of things, and in the year and more since I first came across it, Patreon has become a popular and fairly well-known means of funding creatives and their on-going works. In fact, I’m noticing that it’s slowly becoming a standard. Almost everyone I know who isn’t a well-established creator has one or is creating one, and even then, there are a lot of established creators who are adopting the site to help fund their work. That said, despite not launching a page immediately, and even though I’ve hinted at the coming launch for a long time (the Spring of last year, if I’m not mistaken), I’ve been tirelessly working and reworking my page, the descriptions, the rewards and the goals until I had a format I was (mostly) happy with. (Interestingly enough, in that span, Patreon has changed their user interface a few times.) But, honestly, I would work endlessly on this thing if I don’t just dive right in, thus I set today’s date, ready or not. Though I am ready. 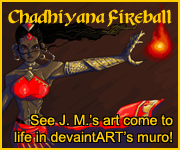 My page features a lot of information on why I’m using Patreon and what for, so I will leave that for the page proper, though the short answer is to help support my creative work, including but not limited to Chadhiyana and Gentleman Cthulhu. What I will say, however, is that part of the reason I put off the launch for so long was that the one thing about crowdfunding which has been a bit off putting to me is asking people to donate money to help you do something you want to do (even if they do get rewards for it, and even if I have supported other people’s campaigns). So I really had to come to a place in myself where I felt comfortable enough doing this (ethically). Then it became a balancing act of coming up with rewards I felt were worth the money potential patrons would be paying, but also not so overwhelming that I didn’t see how I would ever keep up with fulfilling my end of the bargain. Hopefully all of the hard work on the page will pay off. I don’t expect droves of people to descend upon my page overnight, but I am hoping the page offers enough to those that come to it that they’ll be enticed to support my work in this way. Of course, not everyone will to want to–even if they are a fan and that’s okay–but Patreon at least offers yet another way for people to support my work. If you’re reading this, I hope you’ll give the page a look, at the very least. And if you become one of my patrons, thank you! And even if you don’t, thank you as well! I appreciate that you took the time just to read this. It’s my fans and supporters that help motivate me to continue do what I do–though honestly, I’d do it no matter what. It’s almost compulsive, really.